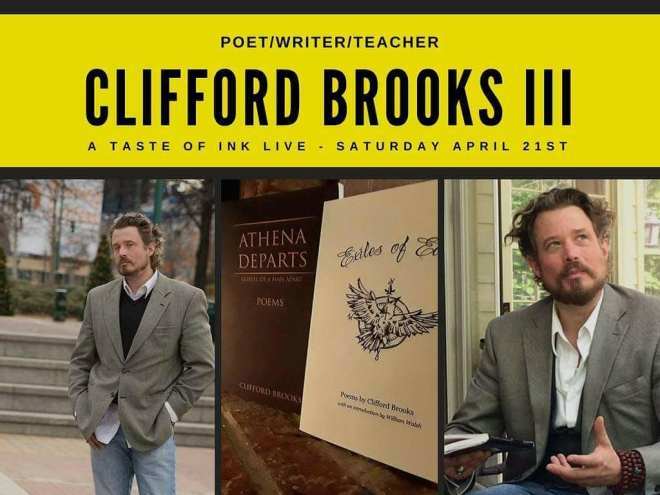 Clifford Brooks was born in Athens, Georgia. His first poetry collection, The Draw of Broken Eyes & Whirling Metaphysics, nominated for the 2013 Georgia Author of the Year Award in Poetry as well as a Pulitzer, will be re-issued by Kudzu Leaf Press in 2018. His full-length collection Athena Departs: Gospel of a Man Apart as well as his limited-edition poetry chapbook Exiles of Eden were published in 2017, also by Kudzu Leaf Press. Clifford is the founder of The Southern Collective Experience, a cooperative of writers, musicians and visual artists, which publishes the journal The Blue Mountain Review and hosts the radio show Dante’s Old South. He currently lives in northwest Georgia.